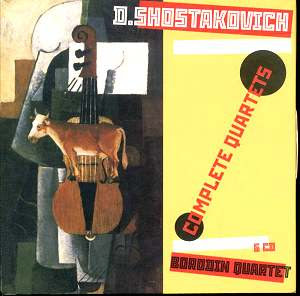 This fell through my letterbox this morning, a cut price 6CD set of Shostakovich’s String Quartets performed by The Borodin Quartet. I know next to nothing about Shostakovich, and like most of my explorations into clasical music over the last year or so its a purchase that was guided by the opinion of someone I respect, on this occasion obviously Keith Rowe. So far I have only played the sixth and last disc in the set, containing Shostakovich’s 14th and 15th Quartets, the last two he wrote. Both are incredible, but the 15th and last is an incredibly passionate, powerful piece of music. At once clearly a mournful, emotionally charged composition (one of the six parts is titled Funeral March) it is also a wonderful study in colour, the contrast in light and shade and the immense beauty to be found in the use of a narrow pallette of tools. (the six parts of the quartet are all fixed in the same key, providing a sense of restrained simplicity to the music). The musicians clearly make these recordings special however, imparting an energy and intense passion into the music that elevates it up into the room around you, weaving its way about your head in quite glorious manner. Having only listened so far to one sixth of this set I sense I may have already heard the best of it, but this one disc alone is worth the entry price alone (only Â£22 for a 6CD set, excellent value). I’m interested to hear if anyone else out there knows this music well and can give their thoughts, but for now thanks Keith. I don’t know it well, but Keith burned me a copy of the 14th and 15th a few years back. our original plan for the Berlin AMPLIFY had a quartet he liked playing the 15th for what he believed would be the first time ever (in keeping with the program of quartet premieres), but we had trouble getting in contact with them and decided it was overly ambitious, even for us. What do you mean by the first time ever Jon? Do you mean the first time that particular quartet played the piece? Friday changed when John dropped out, Otomo came up with the 4 hour idea. the first quartet on Saturday didn’t want to do it (my idea was based mostly on them all living in the same building), so I replaced that and the Moyzes, and Sunday was the same. Is this the recording/quartet that Keith recommended? yes, the Borodin, to both me and Richard (and anyone else who will listen). went out and bought this too. maybe there should be “Keith Rowe seal of approval” stickers on things like this. Where might I purchase this release? I only have the Emerson String Quartet recordings. heh, I finally pulled the trigger and bought one too last night, Amazon UK, although I believe it said it was their last copy in stock. Yeah mine came from Amazon UK too, and it said there were three copies remaining when I ordered. So I wonder where the other copy went, come on, own up!! J.K if you can’t find it drop me an email. Surprised to see how many haven’t listened to Shostakovich until so recently. He’s an interesting figure, primarily post-romantic in style but also kind of kept there by the Soviet system. The wide range of tragedy both personal and societal that he experienced is directly channeled into his music. I hope you guys have checked out some of his amazingly powerful symphonies as well. I have to confess that while quite familiar with the string quartets I haven’t heard the Borodin. As I don’t have a complete cycle of them, I’ll keep an eye out for this set. OTOH it does sound like there are some recordings that at least some prefer. If you guys are interested in quick overview of the recording history check out this article over at Andante. I don’t really enjoy most classical music, so I tend to stick to what Keith tells me to listen to. I hear ya, no slight or anything intended. My surprise is more in that Shostakovich is one of the few 20th C composers you’ll actually hear on mainstream classical radio and films and such. Probably because he pretty much stayed in the 19th C romantic idiom with all its expressiveness and emotion. I’m not really a fan of Shostakovitch’s orchestral work. His quartets are much more adventurous in my opinion. Those and his opera “The Nose” are my favourite works of his.